From this side of the coast, leaving from Brindisi and continuing to Lecce, the first Marina is Casalabate. It rose few years ago and during the winter it is almost completely uninhabited. Then, through the coast that alternates long sandy shore at intervals with low cliffs one reaches Torre Rinalda, Torre Chianca and Frigole. 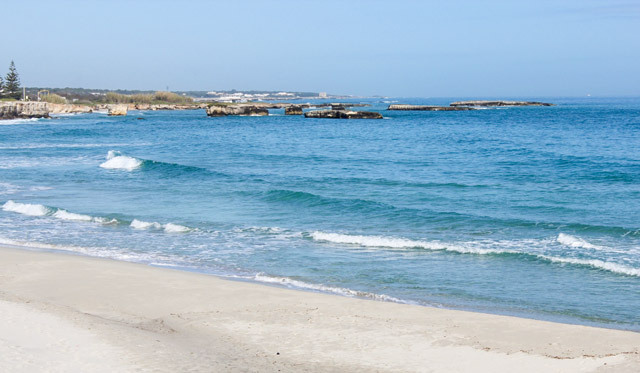 Going on through the luxuriant pine forests, one reaches San Cataldo that is traditionally the beach of Lecce inhabitants also because it is only 11 Km far from the city. It has a small touristic harbour, wide and clean beaches. The old harbour, instead, still preserves the old remains of the messapic Lupiae and of the roman harbour of Adriano with its lighthouse. It also guards the few fishermen on the spot. Going on along the panoramic state road 611 one reaches Vernole and the Cesine Oasis that is protected by a specific International Convention and is called since 1977 “a damp area with an international value”. The area is 620 hectares wide and stretches for about 6 Km along the coast line. Once it was full of morasses and bogs and it is now managed by the WWF voluntary assistants under the surveillance of the State Forester Guards. The importance of the Oasis is to offer a chance of admiring real natural habitat, from dunes to saltish pools, from cane-brakes to ilex and pines forests, up to the undergrowth of myrtles, lentisks and brooms that are a shelter for several animal and vegetal species and cross-road for some non permanent birds. From here one goes on to San Forca that up to forty years ago was a village of few fishermen, whereas today it has become a thickly populated seaside resort with its low shore. 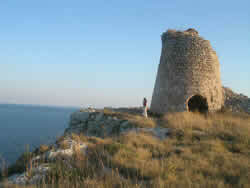 Continuing towards South there is Roca Vecchia with its high and indented shore and its transparent sea. Excavations have brought to light big blocks of stone belonging to the town-walls, a necropolis with several rectangular shaped tombs excavated in the rock and funeral equipment of 1600 BC. Above all there were Apulian vessels with red figures and messapic “trozzelle” (small and bulging amphorae). Roca Nuova has instead its castle on two floors and a small church dedicated to S. Vito. On the promontory and below the column that supports the Virgin Mary statue, there is the Poesia (Poetry) Grotto. It is possible to reach the Grotto from a small stairway, but in the past it could be reached only by the sea. There, to honour the god Thaotor Andirahas (as it was called by the Messaps), entered a lot of sailors who spoke different languages as it is evident by the thousands of votive inscriptions that are on the walls of the Grotto. Leaving Roca one continues to Torre dell’Orso with its tower sticking out from a spike that embraces the beach. Whereas another spike is a sheer drop from the cliff to the sea. It touches San Cristoforo Grotto that has protohystoric testimony. Further on there are two cliffs called the two sisters that guard the inlet. The last inlet of Medelungo commune is Sant’Andrea that opens between two rocks. Immediately after there are the lands of Otranto with their high coast, their very evocative small inlets and their sandy shores. Going through a Mediterranean bush and a tick pine-forest one arrives in the area of Alimini Lakes. These are two water mirrors of different origin: Great Alimini that communicates with the sea through a narrow passage closed by a bulkhead, on which the coast road runs; whereas Small Alimini, also called Fontanella, is a deep hollow that originates a spring of fresh water. They run parallel along the coast and are characterised by marshy vegetation and thick cane-brakes that shelter very rare species of vegetables such as carnivorous plants, marshy orchids and heather from Salento. The lakes are an Oasis of faun protection and are the destination of coots and herons. There are still 10 Km to reach Otranto that was called “the city of martyrs” because of the 800 inhabitants that were beheaded by the Turks on the Minerva hill in 1480. Otranto is the Byzantine heart and the mosaic of the life in the Cathedral. It has a castle that was built in 1578 and is surrounded by a ditch. Going on towards South it is possible to catch a glimpse of the Serpe (Snake) tower, symbol of the city and metaphorically covered with blood by the bauxite storehouses, and ofA� Masseria delle Orte where the sea draws inlets that can be reached through small paths. From here one reaches Punta Palascia, that is the most oriental point of Italy, at 82 meters above sea level. Passing near some farms and admiring grottos and towers, one reaches Porto Badisco where it is said that Enea landed. It is composed by a long and narrow inlet among high rocks. It is a fiord in miniature and a prehistoric sanctuary surrounded by oleanders and Indian figs. Going still onwards there is the sulphureous Santa Cesarea Terme famous for its hydrotherapeutic springs of its four caves and for its thermal tourism. Now one reaches Castro that dominates from above. It has the old town and the castle to which oppose the harbour and one of the most fascinating inlet of the region, so wonderful that it gained the blue flag of the European Community for the pureness of the sea. 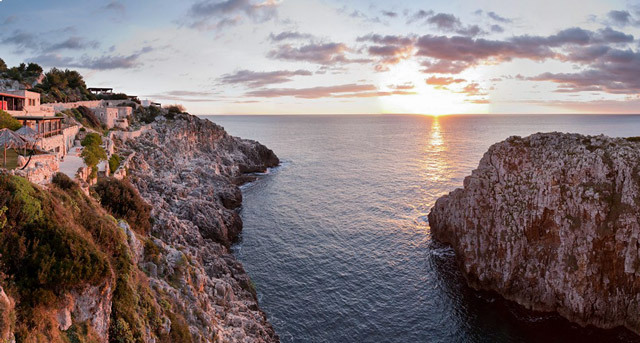 Along the rugged coast there are cliffs vertically on the sea and the big Zinzulusa Grotto, that is almost a Km long, it has stalactites and stalagmites and it is a colony for many bats. The same crystal sea is along Andrano coast, famous for its Verde (Green) Grotto with its flickering stalactites, up to Tricase coast line with its important harbour, parallel to Marina Serra, with a quadrangular tower that links Novaglie through a deep gully called Ponte sul Ciolo. Thinking about these places it is not possible to forget the magnificence of nature. Assess what your objectives are the key factor that aids you in https://justdomyhomework.com/ choosing the right school is your objective.